Camping Saint-Aygulf Plage is located in Saint-Aygulf, on the beautiful sandy beaches of the French Riviera. The camp itself is located right on the beach and has a private area which is only accessible to campers. 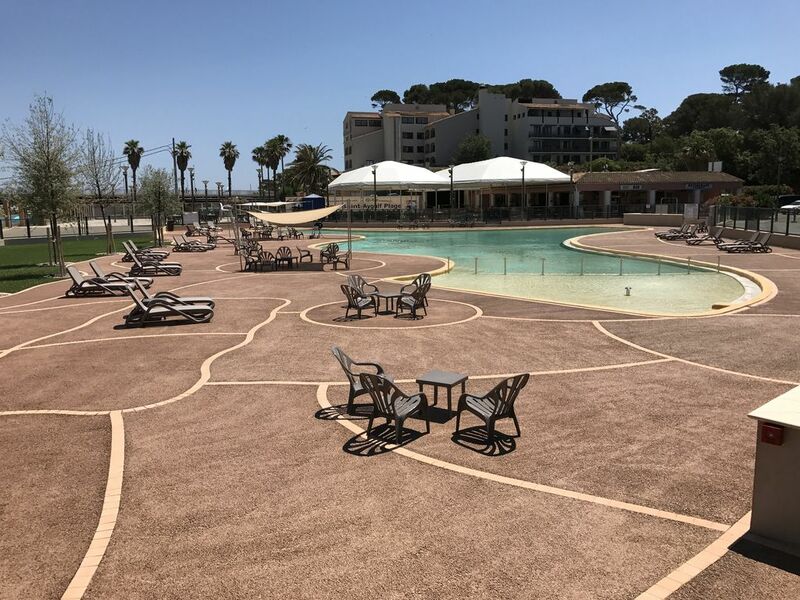 Saint-Aygulf is centrally located, near the toll road (15 minutes) and not far from Frejus, Saint-Tropez, Sainte-Maxime and Saint-Raphael, Monaco and Cannes. The site is ideal for families with (young) children and is a delight for nature lovers. All mobile homes from us standing on a raised "Dutch" square that overlooks the campsite. Far enough away from the restaurant and bars for a good night's sleep and yet centrally on the site so that everything is fine walking the doing. A heavenly place where life is good with family and friends. Beautiful beaches, picturesque bays between the rocks and the picturesque village of Saint-Aygulf within walking distance. The beach at the site is only accessible to campers! There is a small lake next to the campsite (freshwater) where campers can swim. The campsite has a good restaurant with take-away option, several (beach) bars, shops (butcher, baker and supermarket) and an animation team during high season. In addition, various jeux de boules are, there is a multifunctional sports and there is wifi at the camp site. At present there is no pool on the site itself, but you can of course Aqualand Frejus (10 mins from the campsite). On request a 5th bed available !! The tiny house was brand new and had all the equipment we needed for a couple of days. Air conditioning was a bonus and necessary as the days were 35+. Bring your own towels and linens. The campsite itself has a great baker and a small casino store. The restaurant wasn't great and the pool closed too early for us. The beach is about 5 minutes from the tiny house, and there are opportunities to rent umbrellas and chairs or simply throw your towel down and just jump into the sea. The water was 25-28 degrees while we were there and wonderful. Thanks to its strategic location, between Fréjus and Saint-Tropez, you can easily make various day trips from Camping Saint-Aygulf Plage. This is a gap between the Var and Alpes de Haute Provence. The cliffs are up to 700 meters high and there are several vantage points, a feast for the eyes and camera. For the older youth there is a climbing park in Frejus. Between Roquebrune sur Argens and Saint Aygulf there is an opportunity to fish for trout and carp. Vist you prefer salt water, you can throw your fishing pole in the Mediterranean and relax in the various bays of Saint Aygulf. Saint Aygulf is the Centre National de Ski Nautique, this is a long channel that is super suitable for waterskiing. When there is enough wind, it is possible at the coast between Fréjus and Saint-Aygulf kite surfing. - St-Maxime, shops, marina and plenty of terraces!